Get in gear with the Pyle Gear series These speakers are designed to provide the best quality sound for the budget-minded enthusiast. You'll be blasting your tunes and rocking the block with this component speaker kit. It includes one pair of 6.5'' mid-bass speakers, one pair of 0.5'' tweeters, one pair of passive crossover devices, a wiring kit, grills, and installation hardware - it's a perfect way to upgrade and expand the range of your factory system. The mid-bass speakers pump with 400 watts of power and fit in most OEM locations. The 100-watt, 0.5'' silk dome tweeters have three mounting options and a frequency response from 1.3 to 22 kHz. Use the passive crossover networks to separate the signal from your headunit between the mid-bass and tweeter speakers for a richer, more accurate sound. 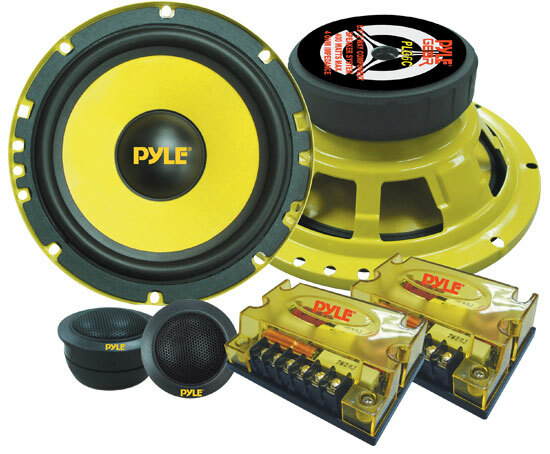 You'll hear everything you were meant to hear with Pyle Gear.